Cloudy, temperature 65. Altitude at the start of our hike was 7634 feet hiking up to 8477 feet. 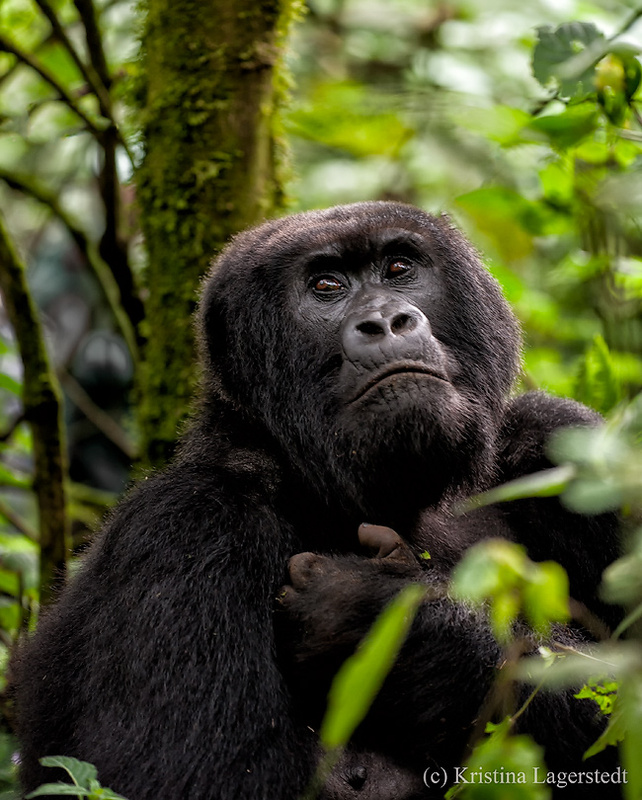 The Hirwa Group is comprised of 19 gorillas and one Silverback. The Silverback, Lucky, is the second strongest Silverback in the entire region. One of the unique features of this group is a pair of twins, which were born to a mother from the Suza Group. Twins are very rare, only seven twins have been born since the late 1960s, and only three pairs have reached maturity. With lots of juveniles in the group, the Hirwa Group had plenty of activity to photograph. While the trek was not necessarily difficult at the beginning, once contact was established, the group moved a great deal. Apparently, the blackback (adult male), one female and a baby were missing from the group; the Silverback was on the move in an attempt to locate them. The researchers continue to monitor the whereabouts of the blackback to see if he will reunite with the group or form his own. Since the Silverback was on the move, we had keep up with him during the shooting hour, and man, were we exhausted. Due to the thick bamboo and heavy jungle we had to adjust with high ISOs. It was difficult shooting, but many wonderful images were captured. During our limited downtime, I have been teaching Lightroom and Photoshop (along with shooting techniques). With only two days left in Rwanda, I wanted to share some images my clients have taken on this trip – I am so proud of their work. Enjoy their images.